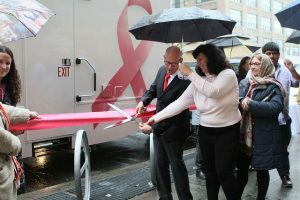 BTTF is proud to be a part of Project Renewal’s ribbon cutting event, unveiling its new 40-foot, state-of-the-art ScanVan mobile mammography clinic. Project Renewal, BTTF’s long-time referral partner, is a nonprofit that works to end the cycle of homelessness through health, homes, and jobs. The Project Renewal ScanVan program is the first of its kind in the nation. Each year it provides free mammograms, clinical breast exams, and care coordination to more than 4,000 underserved women at sites throughout all five boroughs and Long Island. 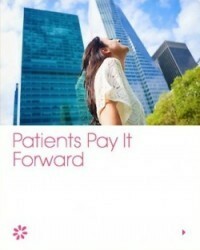 BTTF patients with abnormal findings from clinical breast exams or screenings are contacted by patient navigators who arrange follow-up appointments at partner hospitals, radiology offices and breast centers at no cost to patients. Navigators work with hospital-based case workers to ensure a seamless transition from their initial screening to a hospital-based treatment program. Mary Solomon, director of ScanVan, has first-hand experience with the importance of early detection of breast cancer. Her grandmother was diagnosed in 1982, and the early detection of her grandmother’s disease inspired her mother to launch a mobile mammography clinic, Women’s Outreach Network, in 1986. Mary ran the program with her mother until they encountered financial challenges in 2007, and Project Renewal stepped in to help. The program was seamlessly incorporated into Project Renewal’s fleet of mobile medical vans. 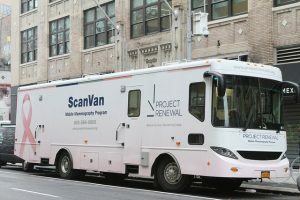 The new Project Renewal ScanVan includes cutting-edge, Hologic full field digital mammography equipment, which will provide hospital-quality screenings to uninsured, under-insured and low-income women. The new van’s interior features a larger waiting area, a mammography room, and a clinic breast exam room. 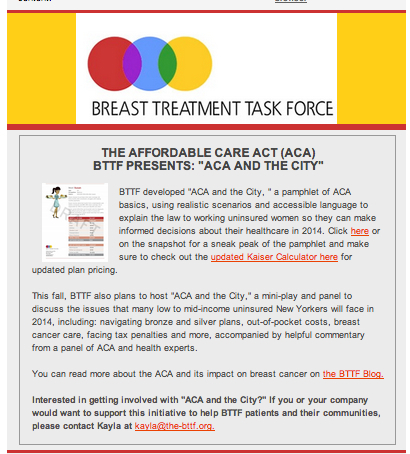 Breast Treatment Task Force is proud to present “BTTF in the Boroughs: Get Breast Cancer Off Your Chest” throughout the five boroughs this fall. This exciting series of breast self-exam workshops will kick-off on Friday September 7th, 2018 at Charles B. Wang Community Health Center (located at 268 Canal Street) from 9:00am to 10:00am. A monthly breast self-exam is an important part of staying aware of your breast health. BTTF in the Boroughs workshop will demonstrate simple steps you can take to check for breast abnormalities and be familiar with your body so that you can recognize changes if they occur. BTTF Staff and Community Referral Partners will be at all locations to answer any questions you may have regarding breast health, screenings, diagnostic care, and more. To stay updated on all events, please visit our Facebook page and follow our instagram account. Breast Treatment Task Force is excited to be a part of this year’s ASCO Annual meeting in Chicago, IL. The focus of our proposal is how the BTTF Model demonstrate the feasibility of implanting a self-funded breast cancer screening and treatment program for uninsured women earning 200% to 400% of the FPL. Our model’s success rely on two important networks: private imaging centers that are willing to offer reduced prices for unused capacity, and community referral partners. The two networks allow BTTF to use vacant appointments and equipment at private centers to provide medical services to women who can’t afford health insurance but don’t meet Medicaid eligibility requirements, also known as the “Unheard Third”. Speed Rack has generously sponsored a free screening day in partnership with BTTF and Project Renewal, scheduled to take place on Tuesday, April 10th from 1:30 to 4:30 p.m. at the Callen-Lorde Community Health Center. Screenings are free for uninsured patients. Click here to learn more information. 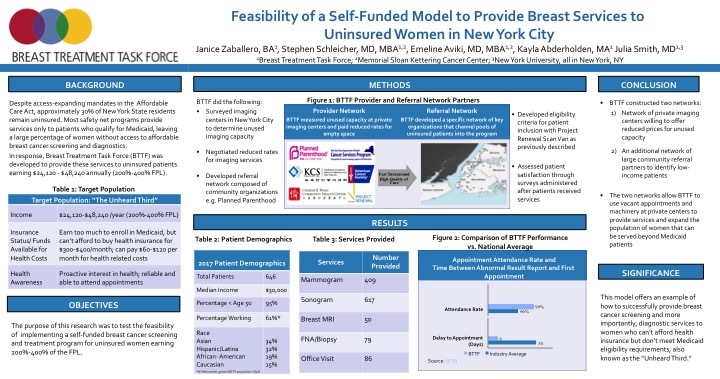 Breast Treatment Task Force and The New York Academy of Medicine presented a poster at the New York Population Health Summit. Click here to download a copy. Breast Treatment Task Force and The New York Academy of Medicine co-authored a piece on the innovative health care payment and delivery model that BTTF offers. Click here to read it. 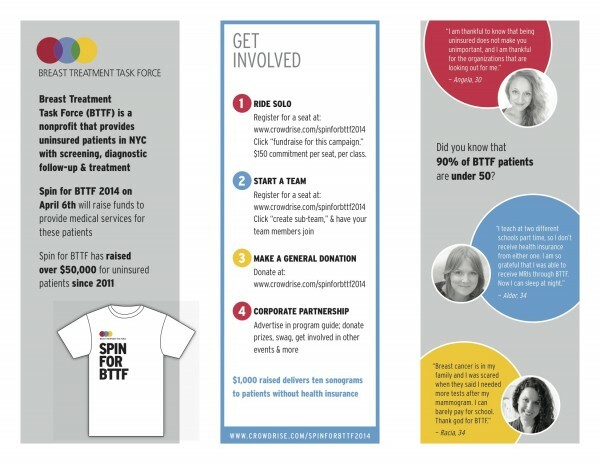 Breast Treatment Task Force’s Executive Director, Janice Zaballero, writes for Everyday Health about the importance of safety net organizations like BTTF. Click here to read it and learn about the future of safety net organizations in response to the Affordable Care Act. It’s time for BTTF’s semi-annual charity auction on CharityBuzz.com! For the past six years, BTTF has partnered with CharityBuzz to auction off some amazing exclusive experiences and luxury merchandise, and this summer’s auction is bigger than ever. Check out the auction to bid on fashion week tickets, celebrity experiences, fitness classes, and more. 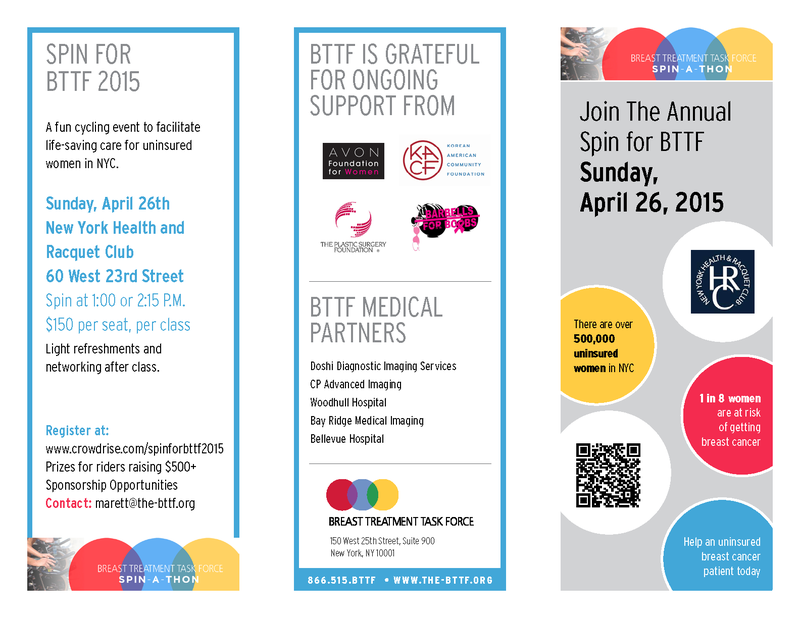 BTTF will hold its Fourth Annual Spin-A-Thon on Sunday, April 26th at New York Health and Racquet Club (60 West 23rd Street). The first class will begin at 1PM, and the second at 2:15PM. For more information, please consult the brochure below, or visit the event’s Crowdrise page to sign up. 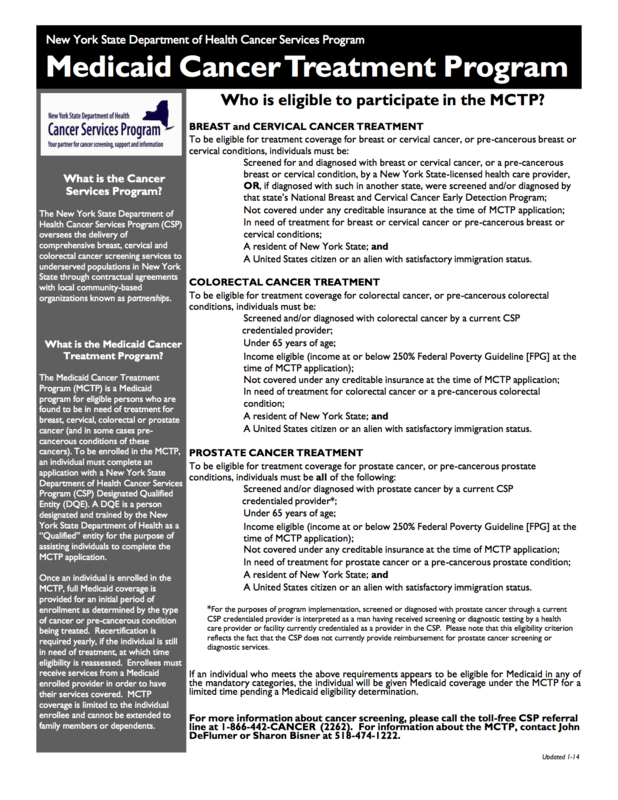 BTTF is excited to announce that some of our patients now qualify for New York State Cancer Services Program’s Medicaid Cancer Treatment Program, meaning that they will now receive financial assistance from New York State for their treatment procedures. BTTF has been designated as a Gold Level Participant on the GuideStar Exchange, the premiere online service for nonprofit reporting, collecting information of over 1.9 million U.S. nonprofit organizations. 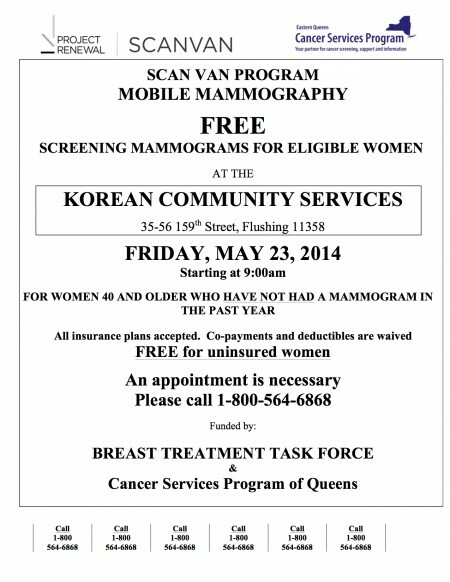 BTTF is proud to partner with KCS and Scan Van and sponsor a free screening day on Friday, May 23 at KCS headquarters for eligible, uninsured women. 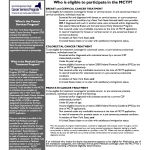 Please see the flyer below for complete details, or click to download. 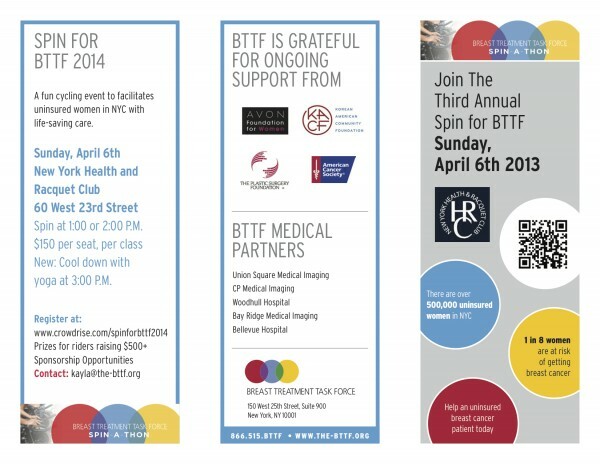 Join us again for the Third Annual Spin for BTTF at New York Health and Racquet Club (60 West 23rd Street) on Sunday, April 6th. 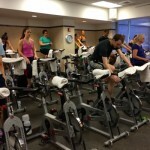 We’re excited for our spinners to meet our very special instructor, Jennylynn Jankesh, who in addition to teaching yoga, spin, sculpting, ballet barre and other classes in the fitness industry for 15+ years, works as an ultrasound technologist at the Dubin Breast Center at Mount Sinai Hospital. BTTF is truly grateful to have her lead this year’s effort. 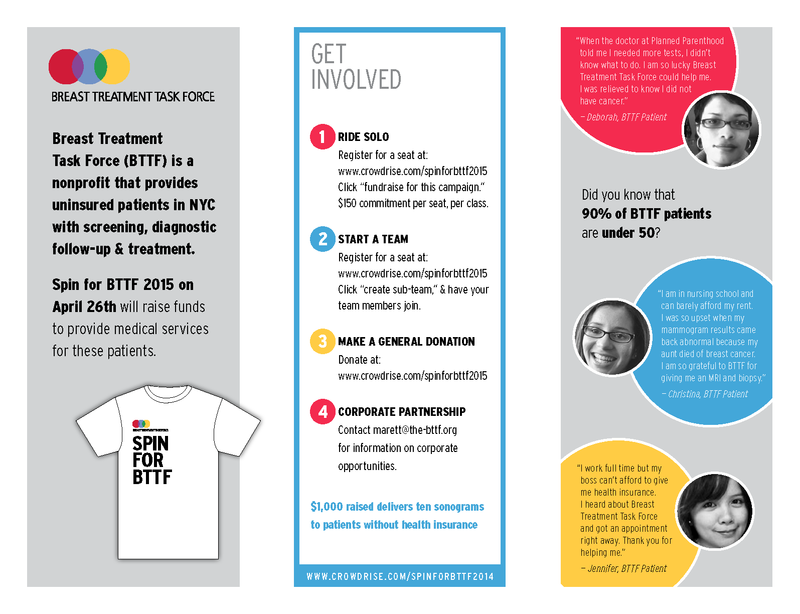 See the flyer below to learn more, or go straight to www.crowrdrise.com/spinforbttf2014. Thanks to Host Committee and everyone who came out to support BTTF, KCS and JASSI for Spring Forward, Give Back at E.V.R. Lounge. The event completely sold out and was a huge success. BTTF is excited to announce a new fundraising campaign as part of Breast Cancer Awareness Month, the BTTF Power of Ten, from October 16th-26th. The idea is simple: donate $10 and forward the campaign on to ten friends, asking them to do the same. Every $10 donated provides $80 in medical services. In ten days, your $10 donation can bring us one step closer to reaching our goal of $10,000. Check out the amazing video our team put together to learn more. Press the orange ‘Donate to this Fundraiser’ button and give $10. 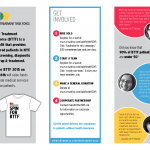 Forward this message along to ten friends, explaining why you support us and asking them to contribute to the BTTF Power of Ten. 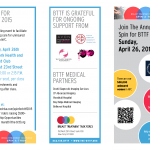 BTTF is honored to be a selected charity for both Journelle and Butterfly Studios during the month of October. Please support Journelle and Butterfly choosing to pamper yourself for good this month and spreading the word to your friends and family. Click both flyers below for more details. 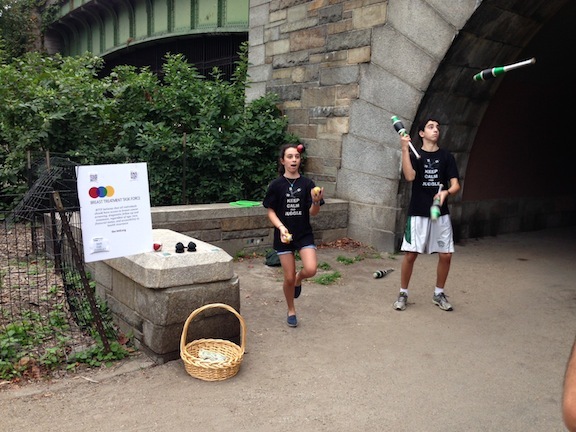 A special thanks to Mia and Sam for using their special skills for a special cause! BTTF is thrilled to announce that we have received a Breast Reconstruction Awareness (BRA) Fund Charitable Care Award from the Plastic Surgery Foundation! With this award, we can directly support surgical care expenses for women having breast reconstruction surgeries. BTTF is truly honored and grateful to the Plastic Surgery Foundation. Click here to read the official PSF Press Release. Click below to read the BTTF Summer 2013 to read about the exciting projects we’ve been working on this year, and what’s coming this fall. Thanks to all the riders and everyone who supported Spin for BTTF 2013. The event was a tremendous success, and raised over $28,000 AND COUNTING–that’s over a 20% increase from last year. BTTF thanks the United States Polo Association and Susan Fredericks for the donation of her horse, Ruana, who will represent BTTF in polo matches to raise funding and awareness to assist uninsured patients in need of screenings, diagnostic follow-up and treatment. Make sure to read our End-of-Year Newsletter to learn about our accomplishments and news in 2012–and what’s planned for 2013. This October marks the fifth year anniversary of BTTF’s partnership with B.R. Guest. In support of Breast Cancer Awareness Month, participating BR Guest restaurants will donate 75% percent of proceeds from specialty desserts to BTTF–treats this year include Pink Velvet Chocolate Torte and Pink Velvet Cupcakes! Since BR Guest partnered with the BTTF in 2008 over $157,000 has been raised and donated to uninsured women with breast cancer. These funds have paid for 262 mammograms, 61 ultrasounds, 16 biopsies, and 5 full cancer treatments, among other medical services. Help making 2012 a record-breaking year to help us deliver $10 million in medical services by the end of this year! Click here to read more, or click here to see a list of participating restaurants. BTTF’s celebrity ambassador, Law & Order Actress Kathryn Erbe attended Cantor Fitzgerald’s annual Charity Day on September 11th, to benefit over 100 charities around the world. With Kathryn’s help on the trading floor, BTTF will be able to provide hundreds of procedures for uninsured patients. Despite the passing of PPACA, the population served by BTTF, individuals earning $28,000-$60,000 annually for 1-2 person households, will continue to face financial barriers to purchasing health insurance. These patients will not receive substantial enough tax credits to cover high insurance premiums, and may face high out-of-pocket costs for diagnostic follow-up. Thus, the need for safety net programs will remain critical in 2014 and beyond. 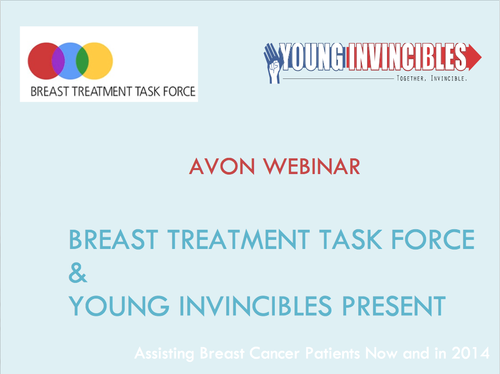 Click on the snapshot above to download the presentation, or click here for the PDF version. The Young Invincibles stopped by BTTF’s offices as part of their Campaign for Young America Bus Tour to discuss healthcare reform and its expected impact on young Americans and BTTF patients. Specifically, we focused on how to prepare, educate and advocate for underserved individuals under the approaching 2014 Patient Protection and Affordable Care Act (PPACA). Please check out The Young Invincible’s website to learn about specific PPACA guidelines and what the mandate means for you. 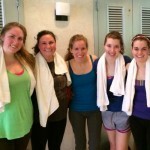 Spin for BTTF was a tremendous success! With your help, we raised over $20,000, delivering over $124,000 in medical services to patients without health insurance. Our second mentoring night at Le Poisson Rouge featured Entrepreneur Graham Hill, founder of TreeHugger and VP of Interactive Media of Discovery’s Planet Green. Graham used personal anecdotes to give his tips on how to take small companies from nothing to something, while still serving society. 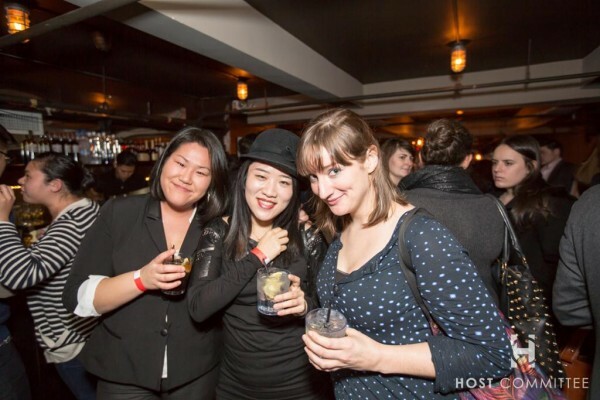 BTTF hosted an exclusive mentoring night on a beautiful Tribeca rooftop garden. Anna Gecan, VP of Original Programming at HGTV in New York, talked about how she and her team developed top-rated television shows, and what matters most when balancing personal and professional growth.